We are prepared to fight and overcome criminal charges related to carrying a concealed handgun, possessing an illegal firearm, and other gun crimes. In general, gun violence is always a problem for law enforcement. The criminal laws in the state of Maryland specify who may possess, carry, and use a weapon, and what weapons are always illegal. Maryland’s gun possession laws and concealed carry laws are designed to prevent, reduce, and—in an ideal world—put an end to gun violence. However, if you are charged with a weapons offense, it is your life that is on the line. You’ll need experienced, high-quality La Plata & Waldorf weapon offense lawyer, and you’ll need it immediately. The Law Office of Hammad S. Matin, P.A. can protect your legal rights after being charged with a weapons offense, and advocate for justice on your behalf. A weapons offense charge requires experienced legal representation. Your criminal defense attorney needs to know how to effectively refute these complex charges and how different courts may handle an alleged weapons crime. 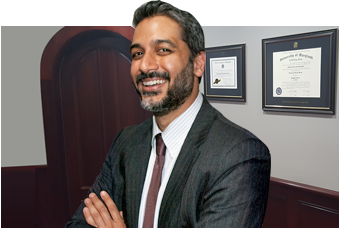 At The Law Office of Hammad S. Matin, P.A., our lawyers have handled thousands of cases in Charles County Circuit Court and District Court, achieving overwhelming success on behalf of our clients. We are prepared to take any criminal matter to trial, including the most serious weapons offense. If you have been arrested for a weapons offense in Charles County, call The Law Office of Hammad S. Matin, P.A. for a free initial consultation today. Our team can immediately begin reviewing the charges you face and determine the appropriate defense strategy. As a former prosecutor himself, Hammad Matin is well-known among local prosecutors and judges as a skilled and experienced criminal lawyer. Our La Plata & Waldorf weapons offenses lawyers can help you achieve the best possible outcome in your case. Se habla español.